People who aren't authors probably don't understand the anxiety that comes along with waiting for the professional reviews to come in. The thing is, we know that teens who read our books mostly don't care about reviews. But the gatekeepers - the librarians, the teachers, maybe even the parents - often do care. Some of my books haven't been liked by all of the professional review publications, but I still have teens who enjoy my books. A review is still just *one* person's opinion, and I totally understand that. I really try NOT to let a bad review get me down (easier said than done when you first read the biting words -- chocolate helps). Still, when a library only has a limited budget every year to buy new books, they are going to have to be careful about how they spend that money. There are SO many YA novels published every year and a good review is going to help a book stand out from the crowd a little bit. So we fret a little in the months leading up to the publication date, hoping the book gets at least one good review. Because it really can make a difference in getting noticed. 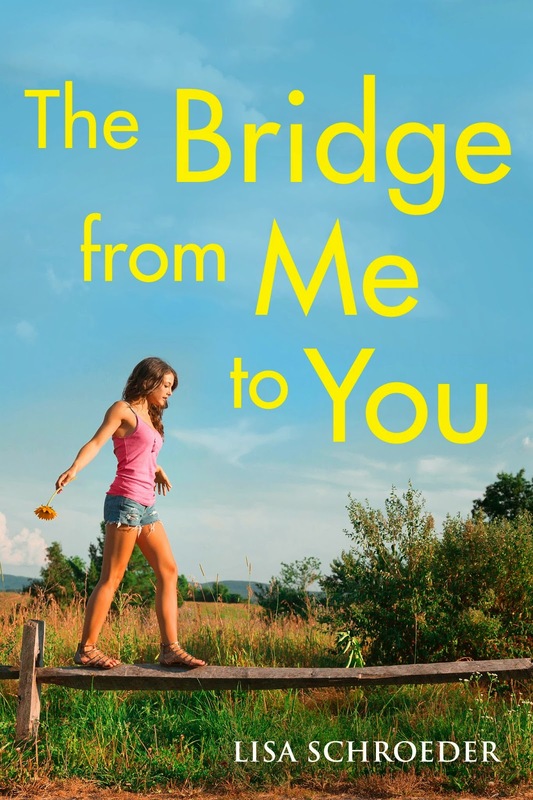 So far, Kirkus, Publisher's Weekly and School Library Journal have all reviewed THE BRIDGE FROM ME TO YOU and have some nice things to say. Thought I'd share a little bit of those reviews with you. Publisher's Weekly has this to say about Lauren and Colby - "two kind, generous teens -- one burdened by her past, the other burdened by his future." School Library Journal says, "the alternating chapters of Lauren’s poetry and Colby’s conversational prose are well written and help reveal the characters refreshingly unique perspectives, as well as their growth in positive ways." Kirkus says, "Lovely in its details." 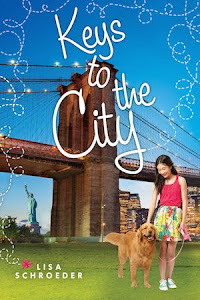 If you'd like to enter a goodreads contest to win one of twenty Advanced Review Copies that Scholastic is giving away, you can go HERE TO ENTER. Stay tuned for an exciting pre-order giveaway later in June coming from my friends at www.novelnovice.com. The first two books in the CHARMED LIFE series are officially out TODAY. Though this past weekend, I found them available already at Barnes and Noble. See? 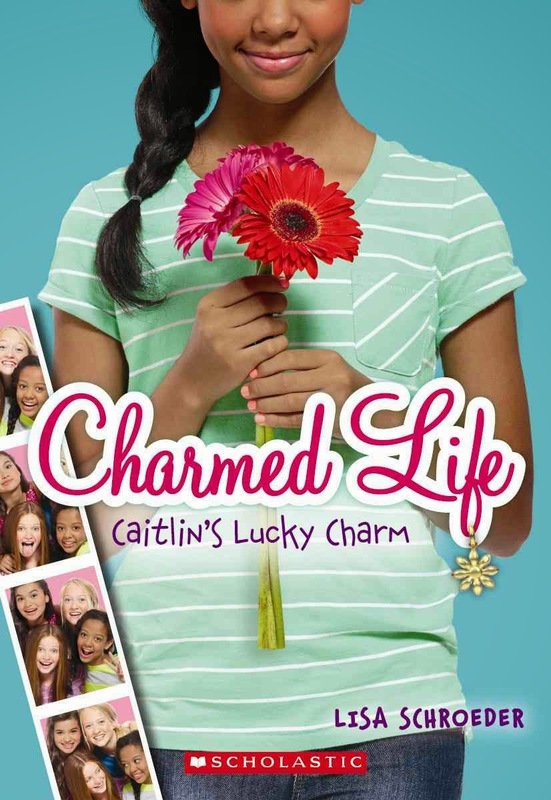 Caitlin's Lucky Charm is the title of book #1. 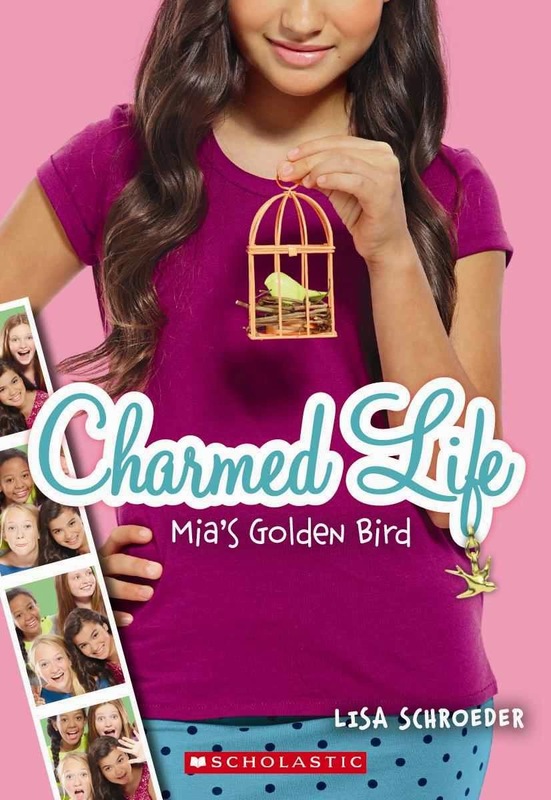 Mia's Golden Bird is the title of book #2. In other news, three more weeks until summer vacation around here. Can't wait!!! This is my dog, Stormy. 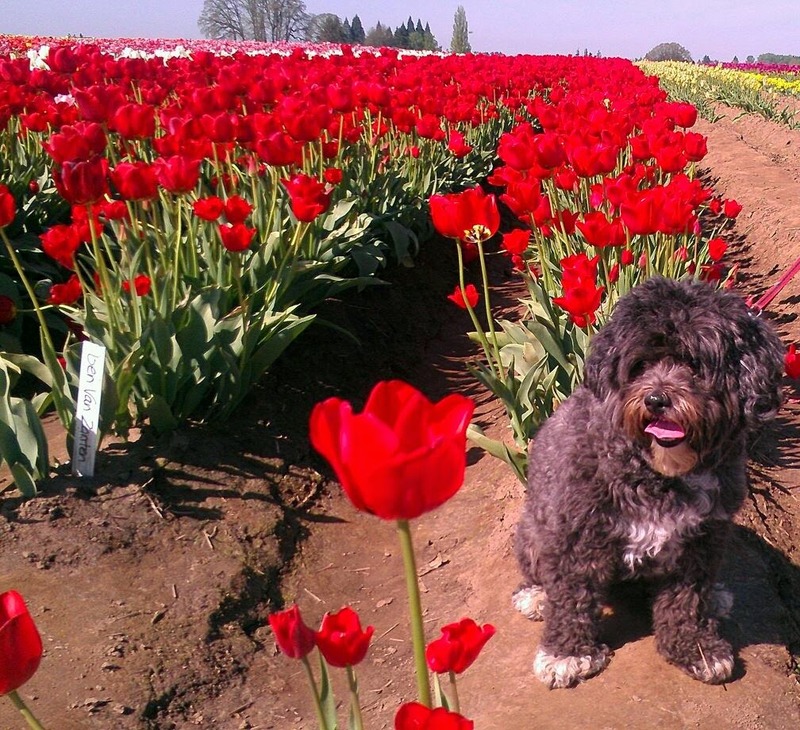 Yes, we took her to the tulip farm with us last month and took pictures of her since we don't have little kids anymore to do that with. Red is her color, don't you think? So, Stormy gets allergies in the spring and summer that cause her to scratch a lot, and they got so bad last year we decided to put her on some medication to help stop the itchiness. For a while, I could put the (large!) pill in a pill pocket and she'd take it no problem. Then one day she figured out that something was in there, and she'd spit it out and just eat the stinky pocket thing. So I'd make a little sandwich with bread and peanut butter, and that worked for a while until it didn't. Same with cheese. You get the point. Eventually, nothing worked. I couldn't hide the pill in food anymore. I had to figure out how to get the thing down her throat a different way. The first few times I pried her jaws open and shoved the thing into her mouth were not pretty. She fought me, I cussed a lot, until eventually she finally took it. I rewarded her heavily with some lunch meat. Next time, same thing. And again, same thing. But somewhere along the way, things changed. Today I noticed how easy it is now. We have our routine. I get the pill out of its packaging and the turkey slices out of the fridge. Stormy sees what's happening and comes over and gets in her spot. I kneel down, give her some love, then open her mouth and stick the pill back in her throat. She doesn't fight me, and actually LETS me do this. She swallows it, and she gets her treat. With every book I start, I'm nervous. Scared things won't go well. As I try to find my way into a story, it can feel like I'm trying to open the jaws of a dog who is trying to back away, while shaking her head. It's difficult. I struggle. I fret and fret some more. But what I've learned is that doesn't mean it's going to *always* be that way. It gets easier. I find the voice. I find my way into the story. Every day that I sit down to write, there is a bit less of a struggle. That's not to say that every day is easy. Some days the words flow and some days they don't as much, but the main thing is to show up, day in, day out. I often tell myself when the words are done, I can read a book. Or go for a walk. Or watch a movie. Or have chocolate. Whatever. Just like with dogs, rewards work. A lot of authors have calendars and stickers and give themselves a sticker when they've done a certain word count. I'm participating in a 30 day challenge with some other authors, and we have a spreadsheet where we are to share our progress every day with each other. It works, man. It really works. I've been writing a long time. But every book is new. Different. Scary. I wonder sometimes if aspiring authors realize this. Just like my dog and that stupid pill, I tell myself giving up is not an option. I just have to keep trying until I find my way to where it's not so scary. Not such a struggle. Maybe even easy. And what do you know. The pill gets swallowed. And the book gets written. It is almost mid-May. That is so crazy. But also good. May, June, July, August and September are my favorite months of the year. 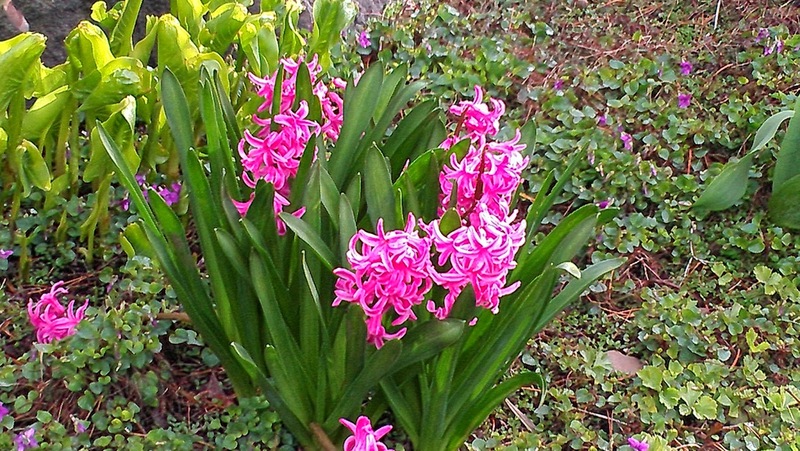 I wake up happy, because there is light and there will be light for many hours in the day. Light, you light up my life. Seriously. And all the color too - color me happy! 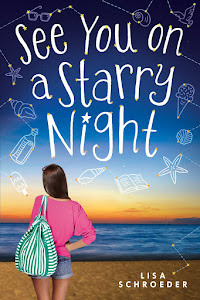 So, I'm working on a final read-through of the fourth CHARMED LIFE book, Hannah's Bright Star, and I can't believe this series is almost over for me. 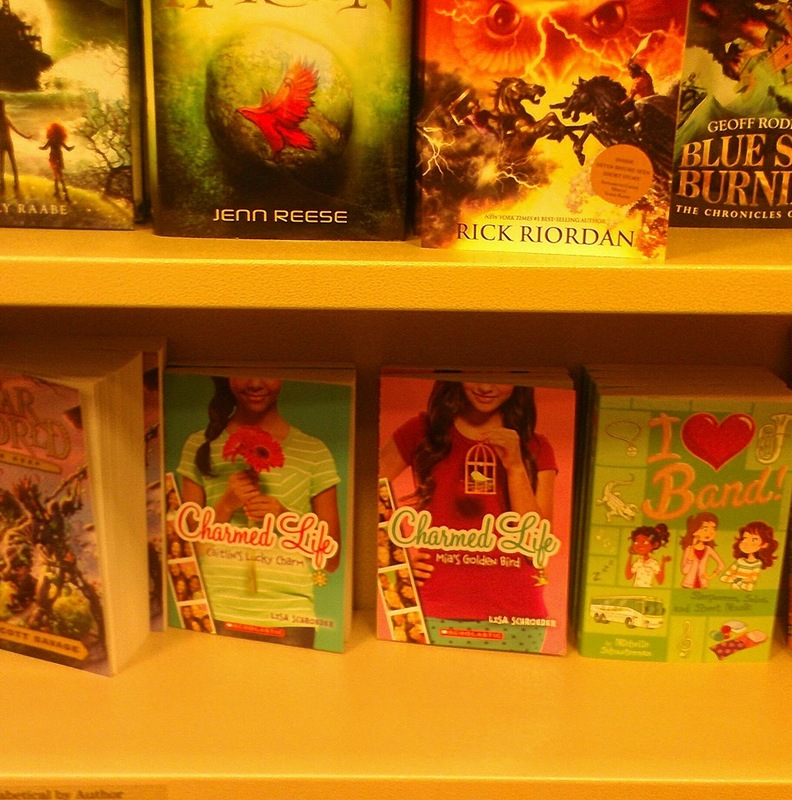 I love the people in these books, especially the main characters: Caitlin, Mia, Libby and Hannah. Maybe it's strange to say I love the characters I created, but I do. What can I say, I am a little bit strange. So, whatever. Now I just have to sit and wait and hope readers love them too. One of the hard things about writing for kids is that kids grow up. The kids who read and loved It's Raining Cupcakes when it came out back in 2010 are now four years older - twelve, thirteen, or fourteen years old. They're checking out books on the teen shelves now, which is great! Yay, keep reading!! But I sit here now wondering, will these new books find a new audience of kids who like reading about families and friendship? It's going to be especially hard to be done with the fourth book, because it's probably the most special one of all to me. Hannah lives on a farm in Tennessee, and in my mind, and the way I wrote it, it's the farm where my grandparents lived. It's the farm where I spent many happy times. There's a scene where Hannah's grandpa comes outside, wearing his red- and-black plaid wool coat and a cowboy hat, and he tells her a story to kind of make a point with something she's struggling with. I started tearing up because my grandpa sometimes wore a red-and-black plaid wool coat and a cowboy hat. I could hear his voice as I read, as if he was telling that story, and you know, maybe he kind of was. He and my grandma are no longer with us, the farm is up for sale, but here, in Hannah's story, they kind of live on. I love that. So yeah...two more weeks. Eep! If you are in the Portland area and are between the ages of 8 and 14 years old, you're invited to a FREE writer's workshop on Saturday, May 10th, at 2:00 p.m. at Powell's at Cedar Hills Crossing in Beaverton. I'll be talking about revision -- sharing tips and tricks, and providing every student in attendance with a worksheet I've created that you can use for stories or school papers. I'll also have signed bookmarks I'll give out to everyone in attendance. If you have books you'd like to have signed, please feel free to bring them along, I'm always happy to sign books. 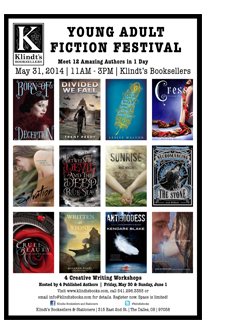 Later in May, on May 31st, I'll be in the Dallas at Klindt's Bookstore for their annual Young Adult Author Fiction Festival, happening 11 a.m. to 3 p.m. So if you live out that way, I hope you'll come and say HI! You can read more about the event by clicking HERE.